Manufacturers and Distributors of Indexable cutting tools and Boring bars for the automotive, aerospace, and other OEM industries. 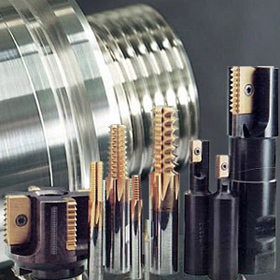 We are quality manufacturers of Indexable Cutting Tool Holders as per ISO standards and Special Tools as per customer requriements.We offer a wide range of Cutting Tools for Hi-Speed and CNC Lathe Machines, VMC, HMC, SPM and Conventional Machines. All these backed up with Right Quality, Right Time, Right Price and Right Delivery has resulted in developing a good reputation in the market. Our design staff, quality control department and equipment operators, combined with our own in-house tool shop experience, are all continuously taking us to new levels in design, building, modifications and tool life. Working closely with customers to design tools for particular functions and providing drawings for confirmed sign off prior to manufacture, costly mistakes are avoided due to mistaken communication. Modifications to existing items or new tools starting from a blank are available within required timeframes providing adequate consultation time has been planned. We always have adequate stock in order to meet customer’s timely requirements. Our tools are manufactured as per international standards. Each component is thoroughly tested prior to assembly. Price must appear in a current published catalogue and must be accurate, not a catalogue error. Price must be presented to ToolSupplyLtd within 30 days from the date of the sales transaction. Item must be the identical name brand and model number with the same included equipment and accessories. Item must be in stock and quantities must be equal. This guarantee excludes non-stocked, discontinued, internet-auction and closeout items. ToolSupplyLtd reserves the right to limit quantities. Copyright © 2010 Toolsupply.com. All Rights Reserved.